If you’ve ever dreamed of getting married in the mountains, Crystal Mountain is your dream come true. Imagine getting married at 6872′ feet with Mt. Rainier towering in the background. Or having your ceremony outdoors in the clean mountain air, surrounded by trees and wildflowers. No matter what venue you choose, your guests (and you) will never forget your special day. Winter wedding space is very limited on the mountain. For a smaller, more intimate winter wedding, please contact one of our lodging providers. Alta Crystal Resort can host winter weddings (in conjunction with lodging) of up to 40 in its 1920s meeting lodge, with an additional 20 in a heated outdoor tent on the adjacent deck. In the summer, Crystal Mountain and its lodging partners can help you plan the perfect wedding, rehearsal dinner, brunch or ceremony for up to 400 guests. 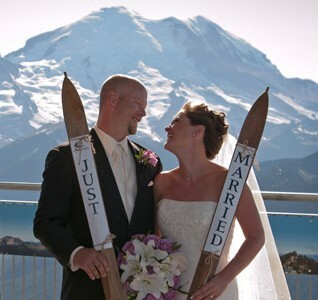 Have your ceremony at Crystal Mountain Summit, on the sun deck, in the chapel or in Crystal Mountain’s main lodge. Crystal specializes in weddings of 75-400 with fine Northwest catering, slopeside and close-by lodging and ample free-time activities for your guests. Space for groups of up to 400 is available on all three levels of the main lodge, the chapel and outside on the sun deck. For a truly unique experience, your guests can ride the Mt. Rainier Gondola, where you can get married on the ridge with Mt. Rainier as your back drop. It is possible to get a permit to get married in Mt. Rainier National Park for smaller, more intimate ceremonies. It’s easiest to get permits for ceremonies during the week, or in the shoulder season (September and October). For the perfect outdoor space, plan your wedding or reception on the Alpine Inn’s lawn. Dance the afternoon or night away under a festive tent for up to 200. Crystal Chalets offers condominium vacation rentals on a hill overlooking the resort, and there are other group lodging options at Crystal. Click here.